Microstructured articles, such as a retroreflective articles, having a plurality of (e.g. cube-corner) microstructured elements and a seal film layer adhered to portions of the cube-corner elements and/or portions of a (e.g. flexible) body layer. The seal film is a thermoplastic polymeric material comprising reaction products of alkylene in an amount of at least about 50% and reaction products ofat least one non-acidic polar monomer. 回射片材具有使入射光转向光发射源的能力。  The retroreflective sheeting having the ability to steer the incident light in the light emitting source. 这种能力已使得回射片材广泛用于多种制品中。 This ability has made retroreflective sheeting is widely used in various articles. 回射片材基本上可分为两类：珠状片材和立体角片材。 Retroreflective sheeting can be substantially divided into two categories: beaded sheeting and cube corner sheeting. 珠状片材采用多个玻璃或陶瓷微球来回射入射光。 Beaded sheeting using a plurality of glass or ceramic microspheres to retroreflect incident light. 另一方面，立体角片材通常采用多个刚性的互连立体角元件来回射入射光。 On the other hand, cube-corner sheeting typically uses a plurality of rigid, interconnected cube corner elements to retroreflect incident light. 可以将镜面反射涂层（例如金属涂层)置于立体角元件的背面，以促进回射。  The mirror surface of the reflective coating (e.g., a metal coating) on ​​the back of the cube corner elements to promote retroreflection. 除了金属涂层之外或用于替代金属涂层的是，还可以将密封膜施加在立体角元件的背面。 In addition to the metallic coating or instead of the metal coating, the seal film also may be applied to the back surface of the cube corner element. 密封膜在立方体的背面保持空气界面，以增强回射性。 An air interface maintaining the sealing film on the back surface of the cube, to enhance retroreflectivity. 适合与柔性回射片材一起使用的各种密封膜已有所描述。  suitable for use with the flexible retroreflective sheeting of various sealing film have been described. 参见（例如）美国专利No. 5，784，197,5,691, 846 和6，318，867。 See, (e.g.) U.S. Pat. No. 5,784,197,5,691, 846 and 6,318,867. 在一个实施例中，描述了一种柔性回射制品，其包括：聚合物透光性本体层，该本体层的弹性模量小于7X IO8帕斯卡，和多个从本体层的主表面凸出的立体角元件；以及粘附于本体层的多个部分上的密封膜。  In one embodiment, there is described a flexible retroreflective article, comprising: a translucent body layer polymer, the elastic modulus of the body layer is less than 7X IO8 Pascal, and a plurality of main surfaces of the body layer the cube-corner elements projecting; and a sealing film adhered to portions of the body on a plurality of layers. 在另一个实施例中，描述了（如，回射）微结构化制品，其包括多个（如，立体角） 微结构化元件以及粘附于立体角元件的多个部分上的密封膜层。  In another embodiment, there is described (e.g. retroreflective) microstructured article, which comprises a plurality (e.g., cube-corner) microstructured elements and the portion adhered to the plurality of cube corner elements sealing film layer. 在以上每个实施例中，密封膜为热塑性聚合物材料，其包含：量为至少约50%的烯属烃（例如乙烯）的反应产物，以及至少一种非酸性的极性共聚单体（如醋酸乙烯、烷基(甲基）丙烯酸酯单体以及它们的混合物）的反应产物。  In each of the above embodiments, the sealing film is a thermoplastic polymer material, comprising: an amount of at least about 50% of the olefinic hydrocarbons (e.g. ethylene) reaction product, and at least one non-acidic polar comonomer the reaction product of a monomer (such as vinyl acetate, alkyl (meth) acrylate monomers, and mixtures thereof). 密封膜的热塑性聚合物材料还可以任选地包含酸改性物、酸酐改性物、一氧化碳改性物、以及它们的组合。 The thermoplastic polymer material of the sealing film may further optionally comprise an acid-modified, anhydride-modified, carbon monoxide modification thereof, and combinations thereof. 热塑性材料的亚烷基包含2至8个碳原子，更典型地包含2至3个碳原子。 Alkylene thermoplastic material comprises from 2 to 8 carbon atoms and more typically comprises 2-3 carbon atoms. 烷基（甲基）丙烯酸酯的烷基通常包含1至8个碳原子，更典型地包含1至4个碳原子。 Alkyl (meth) alkyl acrylate generally contains 1 to 8 carbon atoms, more typically from 1 to 4 carbon atoms. 在一些方面，密封膜包含烯属烃与至少一种共聚单体（其选自醋酸乙烯、烷基（甲基）丙烯酸酯单体以及它们的混合物）所形成的共聚物或三元共聚物。  In some aspects, the sealing film comprises an olefinic hydrocarbon with at least one comonomer (selected from ethylene, alkyl (meth) acrylate monomers, and mixtures thereof acetate) copolymers or terpolymers formed copolymer. 共聚物或三元共聚物通常包含约5重量％至约40重量％的醋酸乙烯、烷基（甲基）丙烯酸酯单体、以及它们的混合物。 Copolymers or terpolymers generally contain from about 5% to about 40% by weight of vinyl acetate, alkyl (meth) acrylate monomers, and mixtures thereof. 密封膜可以选自：酸酐改性的烯属烃_(甲基）丙烯酸酯聚合物、酸改性的烯属烃_(甲基）丙烯酸酯聚合物、酸/丙烯酸酯改性的乙烯-醋酸乙烯聚合物、烯属烃-醋酸乙烯-一氧化碳共聚物、以及它们的混合物。 The sealing film may be selected from: anhydride-modified olefinic hydrocarbons _ (meth) acrylate polymer, acid-modified olefinic hydrocarbons _ (meth) acrylate polymer, an acid / acrylate modified ethylene - vinyl acetate vinyl acetate - - carbon monoxide copolymer, ethylene polymers, and mixtures thereof, olefin genus. 在另一方面，密封膜包含至少两种热塑性聚合物的共混物，并且该共混物包含：量为至少约50%的烯属烃的反应产物以及至少一种非酸性的极性共聚单体（如醋酸乙烯酯、 烷基（甲基）丙烯酸酯单体以及它们的混合物）的反应产物。  In another aspect, the sealing film comprises a blend of at least two thermoplastic polymer and the blend comprising: an amount of a reaction product of at least about 50% of the olefinic hydrocarbon and at least one non-acidic polar the reaction product of the copolymerization of the monomers (such as vinyl acetate, alkyl (meth) acrylate monomers, and mixtures thereof). 密封膜可以是整体式（即单层）膜，或是具有设置在立体角元件与一个或多个附加膜层之间的密封膜层的多层膜。 The sealing film may be a monolithic (i.e. monolayer) film or a multilayer film having a sealing layer is disposed between the cube-corner elements with one or more additional film layers. 图1为包括密封膜的立体角回射片材的实施例的横截面图。  FIG. 1 is a perspective view of a sealing film comprises a corner retroreflective a cross-sectional view of an embodiment of a sheet. 图2为立体角回射片材的实施例的透视图。  FIG. 2 is a perspective view of a cube-corner retroreflective sheet of the embodiment. 图3为具体化的立体角表面的透视图。  FIG. 3 is a perspective view of the perspective angle of the surface of the concrete. 本发明涉及微结构化（例如立体角回射）制品，该制品包括几乎完全覆盖微结构化表面的密封膜（也称为密封用薄膜）。  The present invention relates to microstructured (e.g. cube-corner retroreflective) article, the article comprising the film almost completely cover the sealing surface of the micro structure (also referred to as a sealing film). 在一些实施例中，微结构被设置在（例如柔性）本体层上。 In some embodiments, the microstructured layer is disposed on the body (e.g. flexible). 微结构和本体层通常是透光的。 Microstructure and body layer is generally transparent. 密封膜通常粘结在本体层和/或（例如）立体角微结构化表面的多个部分上。 The sealing film is typically bonded (e.g.) a plurality of portions of the microstructured surface of the cube corner structure of the body layer and / or. 尽管本发明将结合（例如柔性）回射片材进行描述，但本文所述的密封膜也适于粘结在其它微结构化表面上。 While the invention will bind (e.g. flexible) retroreflective sheeting is described, but the sealing film described herein are also suitable adhered to the other microstructured surface. 本文中使用的术语“微结构”如美国专利No. 4，576，850中所定义和解释的那样。  The term used herein "microstructure" as described in US Patent No. 4,576,850 as defined and explained. 微结构一般是不连续体（例如制品表面的凸起和凹陷），其轮廓偏离穿过沿微结构所绘制的平均中线，使得中线上方的被表面轮廓所围绕的面积之和等于中线下方的被表面轮廓所围绕的面积之和，该中线基本平行于制品的标称表面（具有微结构）。 Generally discontinuous microstructure (eg projections and depressions of the surface of the article), which profile deviates from the mean line through the plotted along the microstructures, such that the area of ​​the surface profile above the centerline is equal surrounded and below the center line the area surrounded by the surface contour and the center line substantially parallel to the nominal surface (having a microstructure). 使用光学或电子显微镜对表面上的代表性的特征长度（例如l-30cm)进行测定，偏差的高度通常为约+/-0.005 至+/-750微米。 Using an optical or electron microscope a representative characteristic length (e.g., l-30cm) measured on the surface, a height variation is generally about +/- 0.005 to +/- 750 microns. 平均中线可以是平型、凹型、凸型、非球面型、或它们的组合。 The average line may be flat, concave, convex, aspherical, or combinations thereof. 偏离的程度较低（例如从+/-0. 005至+/-0. 1，或优选为+/-0. 05微米）、并且偏离出现的次数较少或次数最少（即表面没有任何明显的不连续体）的制品可被认为具有基本“平”或“平滑”的表面。 A lower degree of deviation (e.g., from +/- 0.005 to +/- 0.1 or, preferably, +/- 0.05 microns), less or least number of times and offset occurs (i.e., a surface without any significant article discontinuities) can be considered as a surface having a substantially "flat" or "smooth". 其它制品的偏离的程度较高（例如从+/-0. 1至+/-750微米），并且该偏离可归因于包含多个有效的不连续体的微结构，其中多个不连续体是相同的或不同的，并以无规或有序的方式间隔开或邻接。 The higher the degree of deviation of the other articles (e.g., from +/- 0.1 to +/- 750 microns), and the deviation attributable to microstructure comprising a plurality of valid discontinuities, wherein the plurality of discontinuities are the same or different, and in a random or ordered manner spaced apart or contiguous. 结合图1，示例性的立体角回射片材10包括多个立体角元件12与本体层18。  in conjunction with FIG. 1, an exemplary cube-corner retroreflective sheeting 10 comprises a plurality of cube-corner elements 12 and the body layer 18. 本体层18也可以称为覆膜以及基底。 Body layer 18 may also be referred to as a coating film and the substrate. 本体层18的厚度典型地为至少20微米，更典型地为至少50微米。 Body layer 18 typically has a thickness of at least 20 microns, more typically at least 50 microns. 本体层18的厚度通常小于1，000微米，典型地不大于250微米。 Thickness of the body layer 18 is typically less than 000 micrometers, typically no greater than 250 microns. 立体角元件12从本体层18的第一面（通常是背面）凸出。 Cube-corner elements 12 (typically a back surface) projecting from the first surface 18 of the body layer. 立体角元件与本体层通常由透光性聚合物材料形成。  The cube-corner elements and the body layer is generally formed of a translucent polymeric material. 这意味着聚合物能够透射给定波长的入射光中的至少70%的光强。 This means that the polymer is capable of transmitting at least 70% to the incident light intensity of a given wavelength. 更优选的是，用于本发明的回射片材的聚合物具有大于80%的光透射率，更优选地大于90%。 More preferably, the polymer used in the retroreflective sheeting of the present invention has a light transmission of greater than 80%, more preferably greater than 90%. 当回射片材用于除交通安全以外的用途（例如广告显示）时，光透射率可低至5-10%。 When the retroreflective sheet for uses other than traffic safety (e.g., advertisement display), the light transmittance may be as low as 5-10%. 在一个优选的实施例中，本体层18为片材10正面上的最外层。  In a preferred embodiment, the body layer 18 as the outermost layer on the topsheet 10. 如图1所示，光线穿过前表面21进入立体角片材10。 As shown in FIG. 1, the light entering through the front surface 21 of the cube corner sheeting 10. 然后光线穿过本体部分18，照射到立体角元件12的平面上，并按照箭头23所示的入射方向返回。 Then the light passes through the body portion 18, the irradiated plane of the cube corner elements 12 and returned in the incident direction of the arrow 23. 本体层18的功能是保护片材免受户外环境因素的影响和/或为片材提供机械完整性。 Body layer 18 is to affect the function of the protective sheet from the outdoor environmental factors and / or providing mechanical integrity to the sheet. 立体角回射片材可包括基体层，例如美国专利No. 5，450，235所示的那样。  The cube-corner retroreflective sheeting may include a base layer, as shown in U.S. Pat. No. 5,450,235, for example. 在一些实施例中，基体层与立体角元件整体构成，这意味着基体和立方体由单一的聚合物材料形成，而不是由随后结合在一起的两种不同的聚合物层形成。 In some embodiments, the base layer and the cube corner elements integrally configured, which means that the matrix is ​​formed from a single cube and a polymeric material, rather than two different polymeric layers subsequently combined together by the formation. 尤其是对于其中回射片材是柔性的实施例来说，基体层16的厚度典型地在约0至150微米范围内，优选地在大约1至100 微米的范围内。 Especially for retroreflective sheeting which is flexible embodiment, in the range of about 0 to 150 microns, preferably in the range of about 1 to 100 microns thickness of the substrate layer 16 typically. 基体的厚度优选地不大于立体角元件的高度的10%，更优选地为立体角元件的高度的约1-5%。 The thickness of the substrate is preferably not more than 10% of the height of the cube corner elements, and more preferably from about 1-5% of the height of the cube corner elements. 在具有较厚基体部分的片材中，要实现各个立体角元件的分离通常更为困难。 The sheet having a thicker base portion, to achieve the separation of the individual cube corner element is generally more difficult. 立体角元件12的高度典型地在约20至500微米范围内，更典型地在约35至100 微米的范围内。  in the range of about 20 to 500 microns, more typically in the range of about 35 to 100 microns, typically cube-corner element height of 12. 虽然图1所示的本发明的实施例具有单一的本体层18，但是提供一个以上的本体层18(例如多层本体）也在本发明的范围内。 Embodiments of the present invention shown in FIG. 1, although having a single body layer 18, but provides also within the scope of the present invention (e.g., a multilayer body) of more than one body layer 18. 密封膜30粘结在（例如立体角）结构化表面上，即在本体层膜的相对侧。 The sealing film 30 is adhered to the structured surface (e.g. solid angle), i.e. the opposite side of the body layer of the film. 密封膜的作用通常是保持立体角元件（例如）背面的空气界面，以增强回射性。 Role of holding the sealing film is generally cube-corner elements (for example) on the back of an air interface, in order to enhance retroreflectivity. 密封膜还可以用于上色或保护立体角元件免受环境因素的影响。 The sealing film can also be used protective or color cube-corner element from environmental factors. 如图2所示，由严密的交叉连接14构成的网络在整个表面（例如背面）上延伸。  As shown in FIG 2, extends over the entire surface (e.g., back surface) on the tight network of cross-connect 14. 因此，密封区域或密封支架（legs)的图案形成了单元16。 Thus, the sealing region or sealing holder (legs') of the patterning unit 16. 密封区域可形成各种图案，其通常为邻接的多边形，例如平行四边形、三角形和六边形。 Various patterns may be formed in the sealing region, which is usually adjacent polygons, such as parallelograms, triangles, and hexagons. 片材还可包括美国专利5，784，197所述的密封涂层、密封膜上的背衬和/或粘结剂层，以使得立体角回射片材可固定到基材上。  U.S. Pat sheet may further include a seal coat, seal the backing film and / or adhesive layer according to 5,784,197, so that the cube-corner retroreflective sheeting may be secured to a substrate . 图3示出了立体角元件表面的透视图，该立体角元件表面通常是制品的背面。  FIG. 3 shows a perspective view of a cube-corner element surface, the surface of the cube-corner element typically is a rear article. 如图所示，立体角元件12被设置为位于片材一侧的阵列中的配对的形式。 As shown, cube-corner element 12 is provided in the form of paired side sheet material positioned in the array. 每个立体角元件12的形状是具有三个暴露的平面22的三面棱柱。 The shape of each cube-corner element 12 is a three-sided prism having three plane 22 is exposed. 平面22可以彼此基本上垂直（像房间的墙角一样），同时棱柱的顶端M与基底的中心垂直对齐。 22 may be substantially perpendicular to each other plane (the same as the corner of the room), while the top of the vertical center M of the prism is aligned with the substrate. 阵列中每个立体角元件的平面22之间的角度通常一样，其为约90度。 The angle between the plane of the array 22 of each cube-corner element as usual, which is about 90 degrees. 然而，该角度可以偏离开90度，这是众所周知的。 However, the angle may deviate from 90 degrees, as is well known. 参见（例如）美国专利No. 4，775，219 (Appl edorn等人）。 See, (e.g.) U.S. Pat. No. 4,775,219 (Appl edorn et al). 尽管每个立体角元件12的顶端M可以与立体角元件的基底中心垂直对齐（参见（例如）美国专利No. 3，684，348)，但顶端也可以如美国专利No. 4，588，258中所述的那样相对于基底的中心倾斜。 Although each cube-corner element to the top M 12 may be aligned with the vertical center of the base of the cube-corner elements (see (for example) U.S. Pat. No. 3,684,348), but the top may be as described in US Patent No. 4,588,258 as described with respect to the center of the substrate is inclined. 本发明并不限于任何具体的立体角几何形状。 The present invention is not limited to any particular cube-corner geometry. 各种立体角构造是已知的，如美国专利No. 4，938，563、 4，775，219,4, 243，618,4, 202，600 和3，712，706 所述的那些。 Variety of cube-corner configurations are known, such as those 4,938,563, 4,775,219,4, 243,618,4, 202,600 and 3,712,706 according to U.S. Patent No.. 美国专利No. 4，588，258 中所述的立体角构造可在多个观看平面之间提供宽角度的回射。 Cube-corner configuration described in U.S. Patent No. 4,588,258 may provide a wide viewing angle between the plane of retroreflection in plurality. 诸如金属涂层（未示出）等镜面反射涂层也可以任选地置于立体角元件的背面， 以促进回射。  such as a metallic coating (not shown) or the like may be optionally specularly reflective coating on the back of the cube-corner elements to promote retroreflection. 金属涂层可通过已知的技术（例如气相沉积或化学沉积诸如铝、银或镍等金属）来施加。 Metal coating may be applied by known techniques (e.g., vapor deposition or chemical deposition of a metal such as aluminum, silver or nickel). 可以在立体角元件的背面施加底漆层，以促进金属涂层的粘结性。 The primer layer may be applied to the back surface of the cube-corner elements to promote adhesion of the metal coating. 本文所述的是用于（例如柔性）回射制品的密封膜。  herein is a (e.g. flexible) sealing film retroreflective article. 该密封膜为热塑性聚合物材料，其包含烯属烃的反应产物，以及至少一种非酸性单体的反应产物。 The seal film is a thermoplastic polymer material, comprising the reaction product of an olefinic hydrocarbon, and a reaction product of at least one non-acidic monomers. 烯属烃组分的成本较低，并且为密封膜提供了耐用性（例如耐化学品性和耐低温冲击性）。  low-cost olefinic hydrocarbon components, and provides durability (e.g., chemical resistance, and low temperature impact resistance) of the sealing film. 密封膜的聚合物材料的烯属烃的量通常为至少约50重量％。 The amount of alkylene polymer material sealing film is typically at least about 50% by weight. 在一些实施例中， 烯属烃的量为55重量％、60重量％、65重量％、70重量％、75重量％或80重量％。 In some embodiments, the amount of olefinic hydrocarbons is 55 wt%, 60 wt%, 65 wt%, 70 wt%, 75 wt% or 80 wt%. 含2个碳原子（即乙烯）至8个碳原子（即辛烯）的烯属烃组分通常用于制备膜，其中最常见的情况是使用少量的乙烯和（异）丙烯。 Having 2 carbon atoms (i.e., ethylene) to 8 carbon atoms (i.e., octenes) olefinic hydrocarbon component generally used to prepare a film, the most common situation is to use a small amount of ethylene and (iso) propylene. 非酸性单体可提高密封膜与本体层和/或立体角元件的粘合力。  The non-acidic monomer can enhance the sealing film and the body layer and / or adhesion of the cube-corner elements. 非酸性单体反应产物的总量典型地为至少1重量％，更典型地为至少10重量％。 The total amount of non-acidic monomer reaction product is typically at least 1 wt%, more typically at least 10% by weight. 此外，非酸性共聚单体的反应产物的总量通常最多为约40重量％。 Further, the total amount of the reaction product of a non-acidic comonomer is generally up to about 40 wt%. 非酸性共聚单体的反应产物的总量可以最多为约32重量％或25重量％，当密封膜是整体式（即单层）膜时尤其是如此。 The total amount of the reaction product of a non-acidic comonomer may be up to about 32 wt%, or 25 wt%, when the sealing film is a monolithic (i.e., single layer) the film is especially true. 优选的非酸性单体包括醋酸乙烯与烷基（甲基）丙烯酸酯。  Preferred non-acid monomers include vinyl acetate and alkyl (meth) acrylate. 醋酸乙烯具有CH3COOCH = CH2结构；而（甲基）丙烯酸酯单体为具有可聚合的CH2 = CH-(即丙烯酸酯) 基团或CH2 = C(CH3)-端基（即甲基丙烯酸酯基团）的一类单体。 Vinyl acetate having the structure CH3COOCH = CH2; and (meth) acrylate monomer having a polymerizable CH2 = CH- (i.e., acrylate) group or CH2 = C (CH3) - terminal group (i.e., a methacrylate group group) is a monomer. 丙烯酸酯基团往往是优选的，因为该基团比甲基丙烯酸酯基团更具活性。 Acrylate group are often preferred, since this group is more active than methacrylate groups. 烷基（甲基）丙烯酸酯单体具有通用结构CH2 = CHC00CnH2n_lo尽管η可以为1至12范围内的数字，但η通常不大于8，并且丙烯酸甲酯CH2 = CHC00CH3、丙烯酸乙酯CH2 = CHCOOC2H5,甲基丙烯酸甲酯CH2 = C(CH3)COOCH3以及甲基丙烯酸乙酯CH2 = C(CH3)COOC2H5最常用于膜的制备。 Alkyl (meth) acrylate monomer having the general structure CH2 = CHC00CnH2n_lo Although η may number in the range 1 to 12, but usually not more than 8 η, and methyl acrylate CH2 = CHC00CH3, ethyl acrylate CH2 = CHCOOC2H5, methyl methacrylate CH2 = C (CH3) COOCH3 and ethyl methacrylate CH2 = C (CH3) COOC2H5 most commonly used for membrane preparation. 在一个实施例中，密封膜包含烯属烃与至少一种共聚单体的共聚物或三元共聚物，所述共聚单体选自醋酸乙烯、烷基（甲基）丙烯酸酯单体以及它们的各种共聚单体混合物。  In one embodiment, the sealing film comprises an olefinic hydrocarbon copolymer or terpolymer with at least one comonomer, said comonomer is selected from vinyl acetate, alkyl (meth) acrylate monomers and various mixtures thereof comonomers thereof. 因此，密封膜可包含烯属烃与醋酸乙烯的反应产物、烯属烃与单一的烷基（甲基）丙烯酸酯单体的反应产物、烯属烃与醋酸乙烯，以及至少一种烷基（甲基）丙烯酸酯单体的组合的反应产物、烯属烃与两种或更多种烷基（甲基）丙烯酸酯单体的组合的反应产物。 Accordingly, the sealing film may comprise the reaction product of an alkyl olefinic hydrocarbons and vinyl acetate, and a single alkylene (meth) acrylate monomer is the reaction product of vinyl acetate and alkylene, and at least one alkyl ( the reaction product composition of methyl acrylate monomer), a reaction product of an olefinic hydrocarbon with a combination of two or more kinds of alkyl (meth) acrylate monomer. 密封膜的热塑性聚合物材料可以任选地包含酸改性物、酸酐改性物、一氧化碳改性物以及它们的组合。  The thermoplastic polymeric material of the sealing film may optionally comprise an acid-modified, anhydride-modified, carbon monoxide, and combinations thereof modified. 例如，密封膜可包含由烯属烃、至少一种选自醋酸乙烯、烷基（甲基） 丙烯酸酯单体以及它们的混合物中的共聚单体以及至少一种另外的共聚单体（包括（例如）丙烯酸H2C = CHC00H、甲基丙烯酸H2C = C(CH3)COOH,(甲基）丙烯酸（例如马来酸） 酐、一氧化碳以及它们的混合物）所形成的三元聚合物。 For example, the sealing film may comprise from ethylenically hydrocarbon, at least one member selected from vinyl acetate, alkyl (meth) acrylate monomers, and mixtures thereof, and at least one additional comonomer comonomer (including ( e.g.) acrylate, H2C = CHC00H, methacrylic acid, H2C = C (CH3) COOH, terpolymers of (meth) acrylic acid (e.g. maleic) anhydride, carbon monoxide, and mixtures thereof) are formed. 这种另外的共聚单体的量通常最多为约10重量％。 Such additional amount of comonomer is generally up to about 10 wt%. 一般来讲，当烯属烃的百分比降低时，非酸性的极性单体的百分比会增大，从而增强密封膜的柔韧性。  Generally, when the percentage of olefinic hydrocarbons decreases, the percentage of non-acidic polar monomer may increase, thereby enhancing the flexibility of the sealing film. 然而，与含有相同量的非酸性的极性共聚单体的共聚物相比，含有少量酸或酸酐改性的单体会降低柔韧性。 However, compared to a copolymer containing the same amount of non-acidic polar comonomer, or a small amount of acid containing monomer will reduce the flexibility of anhydride-modified. 适用的共聚物包括：乙烯与醋酸乙烯（EVA)、酸改性或酸酐改性EVA、其它的改性EVA(如酸或酸酐/丙烯酸酯改性的EVA)的共聚物；乙烯-丙烯酸乙酯共聚物（EEA)；乙烯-丙烯酸甲酯共聚物（EMA)；酸或酸酐改性的乙烯-丙烯酸酯材料（AEA)；乙烯-醋酸乙烯-一氧化碳三元共聚物（EVACO)；乙烯-丙烯酸丁酯-一氧化碳三元共聚物（EBACO)；以及乙烯-丙烯酸正丁酯共聚物（EnBA)。  Suitable copolymers include: ethylene and vinyl acetate (EVA), acid-modified or anhydride-modified EVA, other modified EVA (such as an acid or anhydride / acrylate-modified EVA) copolymers; ethylene - ethyl acrylate copolymer (the EEA); ethylene - methyl acrylate copolymer (EMA); or an acid anhydride-modified ethylene - acrylate materials (of AEA); ethylene - vinyl acetate - carbon monoxide terpolymers (EVACO); ethylene - butyl acrylate - carbon monoxide terpolymer (EBACO); and ethylene - n-butyl acrylate copolymer (EnBA). 适用于本发明密封膜的EVA(乙烯与醋酸乙烯的共聚物）包括可以商品名“Elvax” 得自杜邦公司的树脂。  applicable to the sealing film of the present invention, EVA (ethylene and vinyl acetate copolymer) may include trade name "Elvax" resin available from DuPont. 其典型的醋酸乙烯的含量在9至40重量％的等级范围内，并且其典型的熔融指数在0.3至500分克/分钟（dg/min)的等级范围内（根据ASTM D1238)。 A typical content of vinyl acetate in the 9-40 wt% of the level range, and is typically within the range of melt index levels in the 0.3 to 500 dg / min (dg / min) (according to ASTM D1238). 适用的EVA还包括可以商品名“Ultrathene”得自Equistar的醋酸乙烯-乙烯高级共聚物。 Suitable EVA can further include the tradename "Ultrathene" available from Equistar vinyl acetate - ethylene copolymer advanced. 其典型的醋酸乙烯的含量在12至18重量％的等级范围内。 Typical vinyl acetate content of 12 to 18 wt% of the level range. 适用的EVA还包括可以商品名ATEVA得自AT Plastics的EVA共聚物。 Suitable EVA can further include the tradename available from AT Plastics ATEVA EVA copolymer. 其典型的醋酸乙烯的含量在2至沈重量％的等级范围内。 A typical content of vinyl acetate in an amount of 2% to heavy grade range. 在另一个实施例中，密封膜包含至少两种不同的热塑性聚合物的共混物。  The blend of embodiment, the sealing membrane comprises at least two different thermoplastic polymers in another embodiment. 共混物的热塑性聚合物通常在共聚单体的类型和/或共聚单体的含量和/或分子量（例如熔体流动指数）方面会不同。 The thermoplastic polymer blends is generally in the type of comonomer and / or comonomer content and / or molecular weight (e.g. a melt flow index) will be different aspects. 共混物可包含两种或更多种均聚物、共聚物或三元共聚物。 It may comprise a blend of two or more homopolymers, copolymers or terpolymers or. 在这类实施例中，共混物包含：量为至少约50%的烯属烃的反应产物，以及醋酸乙烯、烷基（甲基） 丙烯酸酯单体以及它们的混合物的反应产物。 In such embodiments, the blend comprising: an amount of at least about 50% of the reaction product of an olefinic hydrocarbon, the reaction product of vinyl acetate and alkyl (meth) acrylate monomers, and mixtures thereof. 在一些方面，共混物的每种聚合物均包含：量为至少约50%的烯属烃的反应产物，以及醋酸乙烯、烷基（甲基）丙烯酸酯单体以及它们的混合物的反应产物。  In some aspects, each polymer blend contains: an amount of at least about 50% of the reaction product of an olefinic hydrocarbon, and vinyl acetate, alkyl (meth) acrylate monomers, and mixtures thereof the reaction product. 在其它方面，共混物包含：第一聚合物，所述第一聚合物包含：量为至少约50%的烯属烃的反应产物，以及醋酸乙烯、烷基（甲基）丙烯酸酯单体以及它们的混合物的反应产物；以及第二聚合物，其不包含醋酸乙烯、烷基（甲基）丙烯酸酯单体以及它们的混合物的反应产物。  In other aspects, the blend comprising: a first polymer, the first polymer comprises: an amount of at least about 50% of the reaction product of an olefinic hydrocarbon, and vinyl acetate, alkyl (meth) acrylate, the reaction product of acrylate monomers, and mixtures thereof; and a second polymer, which does not contain a vinyl acetate, alkyl (meth) acrylate reaction product of monomers, and mixtures thereof. 第二聚合物通常为聚烯烃，其占主要量的是亚烷基（如之前所述的那些）。 The second polymer is typically a polyolefin, a major amount of which is an alkylene group (e.g., those described previously). 适用的聚烯烃包括离子键乙烯共聚物（例如SURLYN-8920与SURLYN-9910)、低密度聚乙烯，以及聚乙烯共聚物（其包括酸官能化聚合物，如聚（乙烯-co-丙烯酸）“EAA”、聚（乙烯-co-甲基丙烯酸）“EMA”、聚（乙烯-co-马来酸）以及聚（乙烯-co-延胡索酸））。 Suitable polyolefins include ionomeric ethylene copolymers (e.g., SURLYN-8920 and SURLYN-9910), low density polyethylene, and polyethylene copolymers (including acid functional polymers such as poly (ethylene acrylic acid -co-) " EAA ", poly (ethylene-methacrylic acid -co-)" EMA ", poly (ethylene -co- maleic acid) and poly (ethylene -co- fumaric acid)). 作为另外一种选择，第二聚合物可以是相容的聚氨酯聚合物。 Alternatively, the second polymer may be compatible with the polyurethane polymer. 密封膜可以是整体式膜，即单一的（基本上均一的）层。  The sealing film may be a monolithic film, i.e. a single (substantially uniform) layer. 作为另外一种选择，密封膜可以是多层膜，其包含与至少本体层或立体角元件接触的密封膜层以及（例如外部） 第二膜层。 Alternatively, the sealing film may be a multilayer film comprising a sealing layer at least in contact with the body layer or the cube-corner elements and the (e.g. external) a second film layer. 第二膜层也可包含：量为至少约50%的烯属烃的反应产物，以及醋酸乙烯、烷基(甲基）丙烯酸酯单体以及它们的混合物的反应产物。 The second film layer may comprise: an amount of at least about 50% of the olefinic hydrocarbon reaction products, and reaction products of vinyl acetate, alkyl (meth) acrylate monomers, and mixtures thereof. 然而，第二膜层通常与密封膜层不同。 However, the second layer is usually different from the sealing layer. 例如，第二膜层可以具有不同的熔体流动指数、较高的亚烷基含量和/或不同的添加剂(例如颜料）。 For example, the second film layer may have a different melt flow index, the higher the content of the alkylene and / or various additives (e.g., pigments). 第二膜层可包含聚烯烃，如以上针对共混物所述的那些。 The second film layer may comprise a polyolefin, such as those described above for the blend. 如果第二膜层与密封膜层相异，可以将粘结层放置在密封膜层与第二层之间。 If the second film layer and the sealing layer are different, the adhesive layer may be disposed between the sealing layer and the second layer. 在一些实施例中，例如使用整体式密封膜时，按照ASTM D3418测量，密封膜的熔融点为至少约70°C、75°C或80°C。 When  In some embodiments, for example, integral seal film, measured in accordance with ASTM D3418, melting point sealing film is at least about 70 ° C, 75 ° C or 80 ° C. 具有足够高的熔融点或维卡软化点是重要的，以确保密封膜暴露于高的户外环境温度下时不会变形。 It is important to have a sufficiently high melting point or Vicat softening point, in order to ensure the seal is not deformed when the film is exposed to the outdoor environment under high temperature. 密封膜的变形会导致回射性能的下降。 Deformation of the sealing film may lead to a decline in retroreflective performance. 为了获得低温柔韧性与耐冲击性，密封膜通常具有相对较低的玻璃化转变温度。  In order to obtain low temperature flexibility and impact resistance, sealing films generally have a relatively low glass transition temperature. 密封膜的玻璃化转变温度优选地低于25°C，更优选地低于10°C。 The glass transition temperature of the sealing film is preferably less than 25 ° C, more preferably below 10 ° C. 通常优选的是，按照ASTM D 1238测量，密封膜的熔融指数低于25g/10分钟。 It is generally preferred, measured according to ASTM D 1238 melt index of the sealing film is less than 25g / 10 min. 具有高共聚单体含量和熔融指数的烯属烃共聚物通常更易于熔融粘结。 Alkylene copolymers having a high comonomer content and melt index is generally easier to melt bonding. 然而，高熔融指数可导致回射性能下降。 However, high melt index can result in the retroreflective performance. 对于市售的共聚物或三元共聚物，供应商可能会报告醋酸乙烯或其它共聚单体的含量。  For commercially available copolymers or terpolymers, the supplier may report the content of vinyl acetate or other comonomers. 可以用各种已知的定性和定量技术（例如核磁共振、气相色谱法、质谱分析以及FT-红外分析）来分析市售的膜以及适合用于制备膜的材料，以确定亚烷基、醋酸乙烯与烷基（甲基）丙烯酸酯的量。 It can be a variety of known quantitative and qualitative techniques (e.g. NMR, gas chromatography, mass spectrometry and FT- IR analysis) to analyze the film, and a commercially available material suitable for the production of films, in order to determine an alkylene group, acetic acid amount of ethylene with an alkyl acrylate (meth). 密封膜、立体角或本体层的组合物可以任选地包含一种或更多种反应性（例如烯键不饱和）成分和/或一种或更多种非反应性成分。  The compositions of the sealing film, or cube-corner body layer may optionally contain one or more reactive (e.g. ethylenically unsaturated) component and / or one or more non-reactive components. 可以在本体部分或立体角元件或密封膜中加入各种添加剂，如溶剂、链转移剂、着色剂（如染料）、抗氧化剂、光稳定剂、紫外线吸收剂、加工助剂（如防粘连剂、隔离剂、润滑剂）、以及其它添加剂，如美国专利5，450，235中所述的那样。 Various additives may be added to the body portion or cube-corner element or a sealing film, such as solvents, chain transfer agents, colorants (e.g., dyes), antioxidants, light stabilizers, ultraviolet absorbers, processing aids (e.g., anti-blocking agents , release agents, lubricants), and other additives, as described in U.S. Patent No. 5,450,235 described above. 在一些实施例中，密封膜还包含至少一种颜料、染料、或它们的组合。  In some embodiments, the sealing film further comprises at least one pigment, dye, or combinations thereof. 据认为，可以在密封膜中使用各种遮光剂，以提高片材的白度。 It is believed that a variety of sunscreens may be used in the sealing film in order to improve the whiteness of the sheet. 在至少一些实施例中，优选的是在密封膜中掺入约5重量％至约30重量％的白色颜料。 In at least some embodiments, it is preferably about 30 wt% to about 5% by weight of white pigment incorporated in the sealing film. 20重量％的EVA树脂和80重量％的TW2 的颜料混合物（可以商品名“4048 白色VAC”（4048 White VAC)从PolyOne Corporation, Avon Lake，OH商购获得）尤其适合于添加到以乙烯-醋酸乙烯共聚物为基础的密封膜中。 20% by weight of an EVA resin and a pigment mixture of 80% by weight of TW2 (the trade name "4048 White VAC" (4048 White VAC), Avon Lake, OH commercially available from PolyOne Corporation) are particularly suitable for addition to an ethylene - vinyl acetate ethylene copolymer-based sealing film. 由于颜料的引入会降低粘合力，所以也考虑使用多层膜，其中与本体层或立体角元件接触的密封膜层具有透光性，并且一个或更多个外层包含颜料。 Since the pigment is introduced will reduce the adhesive strength, it is also conceivable to use a multilayer film, wherein the sealing layer in contact with the body layer or the cube-corner element having a light-transmitting, and one or more outer layer comprises a pigment. 本发明的立体角回射片材可通过以下步骤制备：（a)用透光性材料制成多个立体角元件；并且（b)将本体层固定在多个立体角元件上。  The present invention cube-corner retroreflective sheeting may be prepared by the following steps: (a) a plurality of light-transmissive material cube-corner elements; and (b) fixed to the body layer in the plurality of cube corner elements. 可以根据多种已知的（或后来发现的）用于制备立体角片材的方法制备片材，参见（例如）美国专利No. 3，689，346、 3，811，983,4, 332，847,4, 601，861,5, 491，586,5, 642，222 和5，691，846。 According to a variety of known (or later discovered) methods for preparing the preparation of a sheet of cube corner sheeting, see (for example) U.S. Pat. No. 3,689,346, 3,811,983,4, 332, 847,4, 601,861,5, 491,586,5, 642,222 and 5,691,846. 密封膜可以部分地或完全地粘结在立体角元件上。  The sealing film may be partially or completely bonded to the cube corner element. 如图1所示，由于布置在柔性本体层上的立体角元件的分离的结果，因此密封层可以至少部分地直接粘结在独立的立体角元件之间的本体层上。 As shown, as a result of the separation of cube corner elements disposed on the flexible body layer, the sealing layer may be bonded directly to at least partially between the individual cube corner element 1 on the body layer. 密封技术的示例性例子包括射频焊接、导热密封工艺、超声焊接以及反应性组分（例如会与覆膜形成粘合作用的密封材料）。 Illustrative examples of sealing techniques include radio frequency welding, thermal sealing process, ultrasonic welding, and reactive components (e.g. the sealing material will be formed with the adhesion of the coating film). 密封方法的选择在很大程度上取决于密封层和本体层的性质。 Sealing method selected depends largely on the nature of the sealing layer and the body layer. 本文所述的密封膜（尤其是整体式膜）非常适于通过相对简单和常用的热技术熔融。  As used herein the sealing film (particularly integral membrane) is adapted by relatively simple and conventional hot melt techniques. 对于将热塑性层密封到回射立体角材料上来说，本领域中的通例是使用热压花技术，该技术形成“链节”图案形式的密封区域，该区域产生多个单独立体角元件的密封包。 For sealing the thermoplastic layer to a retroreflective cube corner material, the general practice in the art to use heat embossing technique to form a "chain link" pattern in the form of the sealing region, the sealing region to produce a plurality of individual cube-corner element package. 对热密封区域的支架或“链节”部分的仔细检查表明，对热塑性立体角元件来说，热熔融工艺导致熔融区域内的立体角元件发生显著变形。 Stand or "links" careful examination of the heat-sealed area indicates that portion of the thermoplastic cube corner elements, the thermal fusion process results in cube corner elements within the molten zone occurs significantly deformed. 由于传导作用，密封支架的这种热变形通常远远超出实际密封的区域。 Due to conduction, such heat seal support modification is typically well beyond the actual sealing area. 如果材料中有相当数量的单独立体角元件产生如此分布，那么与未经密封的片材相比，该片材的整体光学性能会大大降低，例如降低30-40%。 If the material is a considerable number of individual cube corner elements have such a profile, then compared with the unsealed sheet, the overall optical properties of the sheet will be greatly lowered, for example 30-40%. 射频（“RF”）焊接是热融合的替代方法。  radio frequency ( "RF") welding is an alternative to thermal fusion. 当射频场施加在含有极性基团的热塑性聚合物上时，极性基团与射频同相转向的倾向决定了RF能量被吸收并转化为极性基团的动力的程度。 When a radio frequency field is applied to the thermoplastic polymer containing a polar group, with the tendency of the RF phase shift with polar groups decided RF energy is absorbed and converted to a power level of the polar group. 该动能以热能的形式传导至整个聚合物分子；如果施加了足够的RF能量，则聚合物将被加热至足以发生熔融。 The kinetic energy is conducted to the entire polymer molecule in the form of heat; if enough RF energy is applied, the polymer will be heated sufficiently melted. 其它有关密封膜的射频粘合的信息在美国专利No. 5，691，856中有所描述。 Other information about the radio frequency bonding the sealing film are described in U.S. Pat. No. 5,691,856 in. 本体层与密封膜（例如密封层）或（例如立体角）微结构层的非结构化表面之间的界面（图1中的16)通常包含提高粘合力的表面处理。  The interface between unstructured surface microstructure body layer and the sealing layer film (e.g., sealing layer) or (e.g. cube-corner) (16 in FIG. 1) generally comprises a surface treatment to improve adhesion. 本体层与立体角之间的界面还可以包含粘合力促进剂。 The interface between the body layer and the solid angle can also comprise adhesion promoters. 各种提高粘合力的表面处理是已知的，其包括（例如）机械粗糙化、 化学处理、（空气或诸如氮气等惰性气体）电晕处理（例如US2006/0003178A1中所述的那些）、等离子处理、火焰处理和光化学辐射。 Various adhesion promoting surface treatments are known, which include (e.g.) a mechanical roughening, chemical treatment, (air or an inert gas such as nitrogen) corona treatment (e.g. as described in US2006 / 0003178A1 those), plasma treatment, flame treatment, and actinic radiation. 作为另外一种选择或除此之外，提高粘合力的表面处理可包括施加粘结层或底漆层。 Alternatively or in addition, the adhesion promoting surface treatment may include applying an adhesive layer or primer layer. 例如，可通过涂覆脂肪族聚酯聚氨酯分散体（可以商品名“QC4820”从KJ Quinn&Co.，Seabrook, NH商购获得）并干燥来使用聚氨酯底漆层。 For example, by coating the aliphatic polyester polyurethane dispersion (trade name "QC4820" from KJ Quinn & Co., Seabrook, NH commercially available) and drying polyurethane primer layer. 界面可包含提高粘合力的表面处理的任何组合。 Interface may comprise any combination of adhesion promoting surface treatment. 立体角元件往往是坚硬而且刚性的。  The cube-corner elements tend to be hard and rigid. 聚合物组合物可以是热塑性物质，在柔性回射片材优选地是可聚合（即可交联）树脂的反应产物时尤其是如此。 The polymer composition may be a thermoplastic material, flexible retroreflective sheeting is preferably a polymerizable especially true when the reaction product (i.e., crosslinking) of the resin. 立体角元件组合物的弹性模量通常大于16 X IO8帕斯卡，优选地大于18 X IO8帕斯卡，并且更优选地大于25 X IO8 帕斯卡。 Elastic modulus of the cube corner element composition is generally greater than 16 X IO8 Pascal, preferably greater than 18 X IO8 Pascals, and more preferably greater than 25 X IO8 Pascal. 在此所用的术语“弹性模量”是根据ASTM D882-7^采用静态称量方法A，在初始的夹具间距为12. 5厘米（5英寸）、样品宽度为2. 5厘米（1英寸）、并且夹具分离的速率为2. 5厘米/分钟（1英寸/分钟）的条件下测得的弹性模量。 As used herein, the term "elastic modulus" is based on ASTM D882-7 ^ static weighing method A, the initial clip distance of 12.5 cm (5 inches) of sample width 2.5 cm (1 inch) , and the grip separation rate was 2.5 cm / min (1 inch / min), and the measured elastic modulus. 对于微结构制品是柔性的实施例来说，本体层包含低弹性模量聚合物，以便易于弯曲、卷曲、折曲、贴合或拉伸。  For the microstructured article is flexible embodiment, the body layer comprises a low elastic modulus polymer for easy bending, curling, bending, stretching or bonded. 本体层通常具有小于13X IO8帕斯卡的弹性模量。 The body layer typically have less than 13X IO8 Pascals elastic modulus. 该弹性模量可以小于7X IO8帕斯卡，小于5X IO8帕斯卡或小于3X IO8帕斯卡。 The elastic modulus may be less than 7X IO8 Pascal, less than 5X IO8 pascals or less than 3X IO8 Pascals. 一般来讲，本体层通常具有通常低于25°C的玻璃化转变温度。 Generally, typically having a glass body layer typically below transition temperature of 25 ° C. 本体层通常具有至少为50°C的维卡软化温度。 The body layer typically has at least at 50 ° C Vicat softening temperature. 用于本体层的优选聚合物材料是抗紫外光辐射降解的，以使得回射片材可以用于长期的室外应用。 Preferred polymers for the body layer material is an anti-ultraviolet radiation degradation, so that the retroreflective sheeting can be used for long-term outdoor applications. 优选地选择立体角元件的树脂组合物（和工艺条件），以使得树脂能够渗入覆膜并随后原位固化或以其他方式硬化，从而使得在固化之后，在立体角元件材料与覆膜材料之间形成互穿网络，如美国专利No. 5，691，856所述的那样。  The cube corner element preferably selected resin composition (and process conditions), so that the resin can penetrate into the coating film and then cured in place, or otherwise harden, so that after curing, the cube corner element material overlying the form an interpenetrating network between the film material, as described in U.S. Patent 5,691,856 No.. 用电子显微镜检查回射片材时，优选的是在本体层（例如膜）与立体角元件之间观察到模糊边界，而不是清晰界面。 When using electron microscopy retroreflective sheeting, it is preferable that the body layer (e.g. film) was observed between the cube corner element to the fuzzy boundary, rather than a clear interface. 在立体角组合物固化或硬化的过程中，根据立体角元件材料的组成的不同，各个立体角元件可能会有一定程度的收缩。  In the process of the cube corner composition in cured or hardened, depending on the composition of the cube corner element material, the individual cube-corner element may have a degree of shrinkage. 若覆膜的弹性模量太高，则当立体角元件在固化过程中收缩时，可能对其施加扭转应力。 When the elastic modulus of the film is too high, then the cube corner elements when shrinkage during curing, torsional stress may be applied thereto. 如果该应力足够高，则立体角元件可能被扭曲，从而导致其光学性能降低。 If the stress is sufficiently high, then the cube corner elements may be distorted, resulting in degradation of its optical properties. 如果覆膜的弹性模量比立体角元件材料的模量低足够多，则覆膜可能沿立体角元件的收缩方向变形，而不会对立体角元件施加会导致其光学性能发生不利的降低的变形应力。 If the modulus of elasticity modulus of the cube corner element material coating is low enough, the film may be deformed in the direction of shrinkage of cube-corner elements, cube-corner elements will not cause the optical properties is applied disadvantageously lowered deformation stress. 用来形成立体角元件的热塑性组合物通常具有低的线性成型收缩率，即小于1%。  The cube corner elements for forming thermoplastic compositions having a generally low linear mold shrinkage, i.e., less than 1%. 正如美国专利No. 5，691，845中所述的那样，立体角可聚合树脂组合物通常在固化时收缩。 As in the U.S. Patent No. 5,691,845, the cube corner polymerizable resin compositions typically shrink upon curing. 优选的是，树脂在固化时收缩至少5体积％，更优选的是，树脂在固化时收缩5-20体积％。 Preferably, the resin shrinks at least 5% by volume when cured, more preferably, the resin shrinks 5-20% by volume when cured. 使用会收缩的树脂组合物是为了获得最小或为零的基体厚度。 Use of the resin composition will shrink to obtain minimal or zero thickness of the substrate. 一般来讲，覆膜和立体角元件之间的模量差值通常是大约1.0-1. 5X107帕斯卡或更高。  In general, the modulus of the difference between the film and the cube-corner elements typically about 1.0-1. 5X107 Pa or higher. 随着立体角元件的高度减少，该模量差值有可能达到该范围的最低值，这大概是因为较小的立体角元件在固化期间不会发生如此大的程度的收缩。 With the reduced height of the cube corner elements, the modulus of the difference value as low as possible amount of this range, presumably because the smaller cube corner elements of such a large degree of shrinkage during curing does not occur. 由各种热固性或热塑性聚合物组成的各种聚合物膜基底适合用作本体层。  The various polymeric film substrate made of various thermosetting or thermoplastic polymer suitable for use as body layer. 本体层可以是单层或多层膜。 The body layer may be a monolayer or multilayer film. 可用作柔性回射制品的本体层膜的聚合物的示例性例子包括：(1)氟化聚合物， 例如聚（三氟氯乙烯）、聚（四氟乙烯-co-六氟丙烯）、聚（四氟乙烯-co-全氟代（烷基） 乙烯基醚）、聚（偏二氟乙烯-co-六氟丙烯）；（2)具有钠离子或锌离子的聚（乙烯-co-甲基丙烯酸)离子键乙烯共聚物，例如可得自Ε. I. duPont Nemours, Wilmington, Del.的SURLYN-8920Brand和SURLYN-99IOBrand ； (3)低密度聚乙烯，例如低密度聚乙烯；线性低密度聚乙烯；极低密度聚乙烯；增塑型卤化乙烯聚合物，例如增塑型聚（氯乙烯）；（4)聚乙烯共聚物，包括酸官能化聚合物，例如聚（乙烯-co-丙烯酸）“EAA”、聚（乙烯-co-甲基丙烯酸）“EMA”、聚（乙烯-co-马来酸）以及聚（乙烯-co-延胡索酸）；丙烯酸官能化聚合物，例如聚（乙烯-co-烷基丙烯酸酯），其中烷基为甲基、乙基、丙基、丁基等，或C  Illustrative examples of useful polymer body layer film flexible retroreflective article comprising: (1) fluorinated polymers, such as poly (chlorotrifluoroethylene), poly (tetrafluoroethylene -co- hexafluoro poly (ethylene (2) having a sodium ion or zinc ion; propylene), poly (tetrafluoroethylene -co- perfluoro (alkyl) vinyl ether), poly (vinylidene fluoride -co- hexafluoropropylene) -co- methacrylic acid) ionomer copolymers of ethylene, for example, from Ε I. duPont Nemours, Wilmington, Del's SURLYN-8920Brand and SURLYN-99IOBrand;.. (3) low density polyethylene, low density polyethylene, e.g. ; linear low density polyethylene; very low density polyethylene; plasticized vinyl halide polymers such as plasticized poly (vinyl chloride); (4) polyethylene copolymers including acid functional polymers such as poly (ethylene acrylic acid -co-) "EAA", poly (ethylene-methacrylic acid -co-) "EMA", poly (ethylene -co- maleic acid) and poly (ethylene -co- fumaric acid); acrylic functional polymers, e.g. poly (ethylene -co- alkyl methacrylate), wherein alkyl is methyl, ethyl, propyl, butyl, etc., or C H3 (CH2) n_，其中η为◦至12，以及聚（乙烯-co-醋酸乙烯）“EVA” ；和(5)(例如）脂族聚氨酯。 H3 (CH2) n_, wherein η is ◦ to 12, and poly (ethylene-vinyl acetate -co-) "EVA"; and (5) (e.g.) an aliphatic polyurethane. 本体层优选地为烯属聚合物材料，其通常包含至少50重量％的具有2至8个碳原子的烯属烃，其中最常用的是乙烯和丙烯。  The body layer preferably olefinic polymeric material, which typically comprises at least 50% by weight of alkylene having from 2 to 8 carbon atoms, the most commonly used ethylene and propylene. 其它本体层包括（例如）聚（萘二甲酸乙二醇酯）、聚碳酸酯、聚（甲基）丙烯酸酯（如，聚甲基丙烯酸甲酯，也称“PMMA”）、聚烯烃（如，聚丙烯，也称“PP”）、聚酯（如，聚对苯二甲酸乙二醇酯，也称“PET”）、聚酰胺、聚酰亚胺、酚醛树脂、二乙酸纤维素、三乙酸纤维素、聚苯乙烯、苯乙烯-丙烯腈共聚物、环烯烃共聚物、环氧树脂等。  Other body layer comprises (e.g.) a poly (ethylene naphthalate), polycarbonate, poly (meth) acrylates (e.g., polymethyl methacrylate, also known as "PMMA"), poly olefin (e.g., polypropylene, also referred to as "PP"), polyesters (e.g., polyethylene terephthalate, also known as "PET"), polyamides, polyimides, phenolic resins, diacetate fibers Su, cellulose triacetate, polystyrene, styrene - acrylonitrile copolymers, cyclic olefin copolymers, and epoxy resin. 适用于形成立体角元件阵列的可聚合树脂可以是光引发剂与至少一种含丙烯酸酯基的化合物的共混物。  suitable for forming the cube corner element array of the polymerizable resin may be a blend of photoinitiator and at least one agent-containing acrylate-based compound. 优选的是，该树脂共混物含有单官能、双官能或多官能的化合物， 以确保其在受辐射后形成交联聚合物网络。 Preferably, the resin blend contains a monofunctional compounds, difunctional or polyfunctional, in order to ensure formation of a crosslinked polymer network which after irradiated. 能够被可用于本发明的通过自由基机制聚合的示例性树脂的例子包括：衍生自环氧树脂、聚酯、聚醚与聚氨酯的丙烯酸类树脂；烯键不饱和化合物；含有至少一个丙烯酸侧基的异氰酸酯衍生物、除丙烯酸化环氧树脂之外的环氧树脂、以及它们的混合物与组合物。 Examples  can be used in the exemplary resin via a free radical polymerization mechanism of the present invention include: derived from epoxy, polyester, polyether and polyurethane acrylic resin; ethylenically unsaturated compound; containing at least one isocyanate derivatives pendant acrylate group, epoxy resins other than acrylated epoxies, and mixtures and compositions thereof. 此处所用的术语丙烯酸酯包括丙烯酸酯和甲基丙烯酸酯。 As used herein, the term acrylate encompasses acrylates and methacrylates. 美国专利4，576，850 (Martens) 公开了可用于本发明立体角元件阵列的交联树脂的例子。 U.S. Patent No. 4,576,850 (Martens) discloses examples of crosslinked resins can be used in cube corner element arrays of the present invention. 三羟甲基丙烷三丙烯酸酯、三丙烯酸甘油酯、季戊四醇三丙烯酸酯、季戊四醇四丙烯酸酯和三（2-丙烯酰氧基乙基）异氰脲酸酯。  trimethylolpropane triacrylate, glycerol triacrylate, pentaerythritol triacrylate, pentaerythritol tetraacrylate and tris (2-acryloyloxyethyl) isocyanurate. 单官能化合物通常倾向于使覆膜材料更快速地渗透，并且双官能和多官能化合物通常倾向于在立体角元件和覆膜之间的界面形成交联程度更高、更牢固地粘结作用。  Monofunctional compounds typically tend to more rapidly penetrate the graft material, and difunctional and polyfunctional compounds typically tend to the interface between the film and the cube corner elements form a higher degree of crosslinking, more firmly glued knot effect. 其它烯键式不饱和化合物和树脂的一些代表性例子包括：苯乙烯、二乙烯基苯、乙烯基甲苯、N-乙烯基甲酰胺、N-乙烯基吡咯烷酮、N-乙烯基己内酰胺、单烯丙基酯、多烯丙基酯和多甲基烯丙基酯（例如邻苯二甲酸二烯丙基酯和己二酸二烯丙基酯）、以及羧酸酰胺（例如N，N- 二烯丙基己二酰二胺）。  Other Some representative examples of ethylenically unsaturated compounds and resins include: styrene, divinylbenzene, vinyltoluene, N- vinylformamide, N- vinyl pyrrolidone, N- vinyl caprolactam, monoallyl esters, allyl esters and methallyl esters (e.g., diallyl phthalate, diallyl adipate and esters), and carboxylic acid amides (e.g. N, N- diallyl adipamide). 在此可以使用阳离子型可聚合材料，其包括但不限于含有环氧基官能团和乙烯基醚官能团的材料。  herein may be used cationically polymerizable material, including but not limited to materials containing epoxy functional group and a vinyl ether functional groups. 这些体系是通过鐺盐引发剂（例如三芳基硫鐺盐和三芳基碘鐺盐）进行光引发的。 These systems are photo-initiators initiators (e.g. triarylsulfonium salts and triaryl pan pan iodide salts) by pan salt. 可聚合树脂可包含至少一种双官能环氧（甲基）丙烯酸酯、至少一种双官能（甲基）丙烯酸酯单体、至少一种具有至少三个（甲基）丙烯酸酯基团的多官能化合物以及可任选的含氮成分的组合。  The polymerizable resin may comprise at least one difunctional epoxy (meth) acrylate, at least one difunctional (meth) acrylate monomer, at least one having at least three (meth) acrylate groups polyfunctional compounds and combinations groups optionally a nitrogen-containing component. 双官能环氧（甲基）丙烯酸酯和双官能（甲基）丙烯酸酯单体可以以至少约5 重量％和10重量％以及这两个值之间的任意量存在于可聚合组合物中。  The difunctional epoxy (meth) acrylate and a bifunctional (meth) acrylate monomer may be present in any amount between at least about 5 wt% and 10 wt% and the two values ​​in the polymerizable composition It was. 通常，这类双官能（甲基）丙烯酸酯单体的量不会超过约40重量％。 Typically, (meth) acrylate monomer such bifunctional not exceed about 40 wt%. 一种示例性的环氧二丙烯酸酯可从Cytek以商品名“Ebecryl3720”商购获得。 An exemplary epoxy diacrylate available under the trade name "Ebecryl3720" commercially available from Cytek. 多官能化合物通常以至少约10重量％ (例如15重量％、20重量％、25重量％、30 重量％、35重量％、40重量％和这些值之间的任意量）的量存在于可聚合组合物中。  The polyfunctional compound is generally at least about 10 wt% (e.g. 15 wt%, 20 wt%, 25 wt%, 30 wt%, 35 wt%, 40 wt% and any amount between these values) is present in an amount in the polymerizable composition. 通常， 多官能化合物的量不大于约70重量％。 Typically, the amount of the polyfunctional compound is not greater than about 70 wt%. 由于甲基丙烯酸酯基团的活性往往低于丙烯酸酯基团的活性，因此优选丙烯酸酯官能团。  Since the active methacrylate groups often less active than the acrylate group, acrylate functionality is preferred. 可辐射（例如UV)固化的组合物一般包括至少一种光引发剂。  The radiation (e.g. UV) curable compositions generally comprise at least one photoinitiator. 可以使用浓度为约0. 1至约10重量％的光引发剂或光引发剂组合。 It may be used at a concentration of from about 0.1 to about 10% by weight of photoinitiator or photoinitiator combination. 更优选的是，光引发剂或它们的组合以约0. 2重量％至约3重量％的浓度进行使用。 More preferably, the photoinitiator or a combination thereof from about 0.2 wt% to be used in a concentration of about 3% by weight. 一般来讲，光引发剂是至少部分可溶的（例如，在树脂的加工温度下可溶），并且聚合后基本上无色。  Generally, the photoinitiator is at least partially soluble (e.g., soluble at the processing temperature of the resin) and substantially colorless after polymerization. 光引发剂可以是有色的（例如黄色），前提条件是光引发剂在暴露于紫外光源后变得基本上无色。 The photoinitiator may be colored (e.g. yellow), with the proviso that the photoinitiator to become substantially colorless after exposure to the UV light source. 适用的光引发剂包括单酰基膦氧化物和双酰基膦氧化物。  Suitable photoinitiators include monoacylphosphine oxide and bisacylphosphine oxide. 市售的单酰基膦氧化物或双酰基膦氧化物光引发剂包括：2，4，6_三甲基苯甲酰二苯基氧化膦，其可以商品名"Lucirin ΤΡ0”从BASF (Charlotte，NC)商购获得；乙基_2，4，6-三甲基苯甲酰苯基亚膦酸酯，其也可以商品名“LucirinTPO-L”从BASF商购获得；以及双（2，4，6_三甲基苯甲酰）-苯基氧化膦，其可以商品名“Irgacure819”从Ciki Specialty Chemicals商购获得。 Commercially available mono acyl phosphine oxide or bisacylphosphine oxide photoinitiators include: 2,4,6_ trimethylbenzoyl diphenyl phosphine oxide, available under the trade name "Lucirin ΤΡ0" from BASF (Charlotte, NC) are commercially available; ethyl _2,4,6- trimethylbenzoyl phenyl phosphinate, which may be the trade name "LucirinTPO-L" commercially available from BASF; and bis (2,4 , 6_ trimethylbenzoyl) - phenyl phosphine oxide, available under the trade name "Irgacure819" commercially available from supplier Ciki Specialty Chemicals. 其它合适的光引发剂包括2-羟基-2-甲基-1-苯基-丙-1-酮（可从CikiSpecialty Chemicals以商品名“Darocurll73”商购获得）和其它光引发剂（可从Ciki Specialty Chemicals以商品名“Darocur4265，，、“ Irgacure651，，、“ Irgacure 1800，，、“ Irgacure369，，、“ Irgacure 1700，，、 和“ Irgacure907 ”商购获得)。 Other suitable photoinitiators include 2-hydroxy-2-methyl-1-phenyl - propan-1-one (available under the trade name "Darocurll73" commercially available from CikiSpecialty Chemicals) and other photoinitiators (available from Ciki Specialty Chemicals under the trade name "Darocur4265 ,,," Irgacure651 ,,, "Irgacure 1800 ,,," Irgacure369 ,,, "Irgacure 1700 ,,, and" Irgacure907 "commercially available). 自由基清除剂或抗氧化剂通常以约0. 01重量％至0. 5重量％的量被使用。  The radical scavengers or antioxidants are typically used in an amount of about 0.01 wt% to 0.5 wt%. 合适的抗氧化剂的示例性例子包括：受阻酚醛树脂，例如那些可从Ciki-Geigy Corp以商品名“ IrganoxlOlO，，、“ Irganoxl076，，、“ Irganoxl035” 和“ Irgafosl68” 购得的树脂。 Illustrative examples of suitable antioxidants include: hindered phenolic resins such as those available under the trade name "IrganoxlOlO ,,," Irganoxl076 ,,, "Irganoxl035" and "Irgafosl68" available from Ciki-Geigy Corp resin. 当热塑性聚合物被用于（例如立方体）微结构时，其玻璃化转变温度通常大于80°C，并且其软化温度通常大于150°C。  When a thermoplastic polymer is used (such as a cube) of the microstructure, the glass transition temperature is generally greater than 80 ° C, and the softening temperature is typically greater than 150 ° C. 一般来讲，用于立体角层的热塑性聚合物是无定形或半结晶的。 Generally, the thermoplastic polymers used in the cube-corner layer are amorphous or semi-crystalline. 可用于立体角元件的热塑性聚合物的例子包括：丙烯酸类聚合物，例如聚（甲基丙烯酸甲酯）；聚碳酸酯；纤维素，例如醋酸纤维素、纤维素（乙酸酯-co- 丁酸酯）、硝酸纤维素；环氧树脂；聚酯，例如聚（对苯二甲酸丁二醇酯）、聚（对苯二甲酸乙二酯）；含氟聚合物，例如聚（氯氟乙烯）、聚（偏二氟乙烯）；聚酰胺，例如聚（己内酰胺）、聚（氨基己酸）、 聚（六亚甲基二胺-co-己二酸）、聚（酰胺-co-酰亚胺）和聚（酯-co-酰亚胺）；聚醚酮； 聚（醚酰亚胺）；聚烯烃，例如聚（甲基戊烯）；聚(亚苯醚）；聚(苯硫醚）；聚(苯乙烯） 和聚（苯乙烯）共聚物，例如聚（苯乙烯-co-丙烯腈）、聚（苯乙烯-co-丙烯腈-co-丁二烯）；聚砜；有机硅改性聚合物（即，含有较小重量百分比（低于10重量％)的有机硅的聚合物），例如有机硅聚酰胺和有机 Examples  The thermoplastic polymers may be used in cube corner element comprising: an acrylic polymer, such as poly (methyl methacrylate); polycarbonates; cellulose, such as cellulose acetate, cellulose (acetate - co- butyrate), cellulose nitrate; epoxy resin; polyesters such as poly (butylene terephthalate), poly (ethylene terephthalate); fluorine polymers such as poly ( chlorofluoroethylene), poly (vinylidene fluoride); polyamides, such as poly (caprolactam), poly (amino caproic acid), poly (hexamethylene diamine -co- adipic acid), poly (amide -co - imide) and poly (ester imide -co-); polyether ketone; poly (etherimide); polyolefins, such as poly (methylpentene); poly (phenylene ether); poly ( phenylene sulfide); poly (styrene) and poly (styrene) copolymers such as poly (acrylonitrile -co- styrene), poly (styrene-butadiene -co- -co- acrylonitrile); polysulfones ; silicone-modified polymers (i.e., containing a small weight percent (less than 10% by weight) of silicone polymer), such as silicone polyamide and organic 聚碳酸酯；氟改性聚合物，例如全氟聚（对苯二甲酸乙二醇酯）；以及上述聚合物的混合物，例如聚酯与聚碳酸酯的共混物，以及含氟聚合物与丙烯酸类聚合物的共混物。 Polycarbonate; fluorine-modified polymers, such as perfluoro poly (ethylene terephthalate); and mixtures of polymers, such as polyester and polycarbonate blends and fluoropolymer acrylic polymer blend. 立体角元件的（如可聚合或热塑性）树脂可包含含氮成分，如2006年4月18日提交的美国专利申请No. 60/745033中所述的那些；其以引用的方式并入本文。 (E.g., polymerizable or thermoplastic) resin may comprise a nitrogen-containing component, as described in U.S. Patent filed on April 18, 2006 Application No. 60/745033 those described in  of the cube corner element; and by reference in its incorporated herein. 优选的含氮成分包括（例如）可聚合的含胺成分、(甲基）丙烯酸酯官能化的含氮成分和含氮聚合物。 Preferred nitrogen-containing component comprises (e.g.) a polymerizable amine-containing component, (meth) acrylate-functional nitrogen-containing component and a nitrogen-containing polymer. 用于提高整体光返回量相当于取向的均勻性的常见方法是拼接法（tiling)， 即在最终制造过程中以多于一个的取向方向放置多个小的模具部分，如（例如） 在美国专利No. 4，243, 618 (Van Arnam)、美国专利No. 4，202, 600以及美国专利No. 5，936，770 (Nestegard等人）中所描述的那样。  Returns for improving the overall light amount corresponding common method is the uniformity of the alignment splicing (tiling has), i.e. the orientation direction than placing a plurality of small mold part in the final manufacturing process, such as (e.g. ), as in U.S. Patent No. 4,243, 618 (Van Arnam), U.S. Pat. No. 4,202, 600 and U.S. Pat. No. 5,936,770 (Nestegard et al.) as described. 所得片材的第一立体角元件阵列的取向与相邻的立体角元件阵列的取向不同。 A first orientation of the cube corner element array sheet is obtained with an adjacent cube-corner element array orientation different. 所形成的回射片材卷具有由该卷的纵向边缘界定的宽度以及这样的微结构化表面，该微结构化表面具有（例如）由三个相互交叉的凹槽限定的立体角元件阵列。  The retroreflective sheeting having a volume formed by the longitudinal edges defining the width of the roll and such a microstructured surface, the microstructured surface having a (e.g.) consists of three mutually intersecting grooves defining a solid angle element array. 一条凹槽可以基本上垂直于、平行于片材卷的纵向边缘或与片材卷的纵向边缘成0°至90°度角， 这取决于模具的取向。 A recess may be substantially perpendicular to the longitudinal edges parallel to the longitudinal edges of the sheet or the roll sheet roll at 0 ° to 90 ° degrees, depending on the orientation of the mold. /勒克斯/平方米。 / Lux / square meter. 由于回射片材具有柔韧性，所以片材可应用于柔性基底，例如帆布和其它织物、波纹形表面和铆接表面以及具有简单或复合曲线的曲面。  Since the retroreflective sheeting has flexibility, it can be applied to a flexible substrate sheet, canvas and other fabrics, for example, corrugated surface and the caulking surface having a simple or compound curve surface. 柔性回射片材也可应用于易发生热膨胀和收缩的装置（例如，诸如防撞圆筒、路锥等交通装置）。 The flexible retroreflective sheeting may be applied to a device (e.g., means, such as a vehicle collision cylinder, cone, and other road) of thermal expansion and contraction prone. 以下实例进一步说明了本发明的特征和优点。  The following examples further illustrate the features and advantages of the present invention. 然而，应当理解，虽然这些实例可起到示例之用，但是不应以不当地限制本发明范围的方式理解其所用的具体成分、量以及其它条件和细节。 However, it should be understood that although these examples may serve exemplary purposes, but not to limit the scope of the present invention is not particularly appreciated embodiment of local components they use, as well as other conditions and details amount. 包含表1中的实例1-5的密封膜的制品通过结合两种构造来制备。 Sealing film  Table 1 contains Examples 1-5 articles prepared by combining two configurations. 第一构造为位于聚对苯二甲酸乙二醇酯（PET)载体上的密封膜；第二构造为层合在EAA膜的底漆上的立体角微结构，其中底漆在EAA膜的一侧，PET载体在EAA膜的另一侧。 The seal is configured as a first polyethylene film on the polyethylene terephthalate support (the PET); second configuration is a cube corner microstructures laminated on the primer EAA film, wherein a film EAA primer side, PET support side at the other EAA film. 实例1-5的第一构造通过将表1中的每种树脂（可得自Ε. I. DuPontde Nemours and Company ( “DuPont";ffilmington. DE))挤压到大约15cm(6 英寸)宽、0. 05mm(0. 002 英寸）厚的PET载体膜上来制备。 The first configuration  Examples 1-5 in Table 1 by each of the resin (available from Ε I. DuPontde Nemours and Company ( "DuPont";.. Ffilmington DE)) pressed to about 15cm (6 inch ) wide, 0. 05mm (0. 002 inch) thick PET carrier film was prepared. 表1中每种树脂的熔融指数、熔融点与醋酸乙烯百分含量可从dupont. com网站上提供的产品数据表获得。 Table 1 of each of the resin melt index, melting point and the percentage of vinyl acetate available from DuPont. COM Product Datasheet site. 将表1中的每种树脂以颗粒的形式送入1.9cm(3/4英寸）的单螺杆挤出机中，该挤出机可得自CW Brabender Instruments Inc.，SouthHackensack，N. J0 挤出机温度分布从140°C (284 °F )至175°C (347 0F )，使得熔融温度为约175°C (347 0F )。  Table 1 in each of the resin into the form of particles of 1.9cm (3/4 inch) single screw extruder, the extruder available from CW Brabender Instruments Inc., SouthHackensack, N. J0 extruder temperature profile from 140 ° C (284 ° F) to 175 ° C (347 0F), so that a melt temperature of about 175 ° C (347 0F). 当熔融树脂离开挤出机后,使其通过水平模具（Ultraflex-40 ；可得自foctrusion Dies Industries LLC, Chippewa Falls, WI)并被浇注到上文所述的PET载体上。 When the molten resin exited the extruder, passed through a horizontal die (Ultraflex-40; available from foctrusion Dies Industries LLC, Chippewa Falls, WI) and is cast onto the PET carrier as described above. PET载体以大约3米/分钟（10 英尺/分钟）的速度移动。 Mobile PET carrier (10 ft / min) at a speed of about 3 m / min. 使PET载体上的所得熔化密封膜在橡胶辊与淬火钢支撑辊之间运动，以将熔融树脂硬化为厚度大约0.075mm(0.003英寸）的层。 The resulting fusion sealing the PET carrier film between the rubber roller and the hardened steel rollers moving support, the molten resin is cured to a thickness of about 0.075mm (0.003 inch) layer. 卷绕每个所得的第一构造，以形成卷材。 Each of the resultant winding of the first configuration, to form a roll. 第 二构造通过将Primacor3440(EAA ；可得自Dow ChemicalCompany，Midland, MI)以厚度为4密耳的膜的形式浇注到PET载体上来制备，所述PET载体采用上文所述的用于第一构造的挤出工艺进行制备。  The second configuration by Primacor3440 (EAA; available from Dow ChemicalCompany, Midland, MI) was prepared in the form of up to a thickness of 4 mil PET carrier film is cast onto the PET carrier as described above using a prepared in the first configuration of the extrusion process. EAA表面用QC4820底漆（脂肪族聚酯聚氨酯，可得自KJ Quinn&Co, Seabrook, N. H)涂覆，以使得其干燥后的最终厚度为大约2. 5微米（0. 0001 英寸）。 QC4820 surface of EAA primer (aliphatic polyester urethane, available from KJ Quinn & Co, Seabrook, N. H) coating, such that the final dry thickness of about 2.5 microns (0.0001 inches). 按照US 5，691，846中所述及其图5所示的方式，将立体角微结构布置在本体层上。  manner as shown in said US 5,691,846 and 5, the cube corner microstructures are arranged on the body layer. 立体角微结构（在将结构分离为单个立方体之前）具有3组相交的槽（如图2所示）， 该槽的节距（即主槽的间距）为0. 007英寸，底部三角形张角的角度分别为55. 5/55. 5/69 度，从而使立体角元件的高度为76. 2微米（3. 5密耳）。 Cube corner microstructures (single separated prior cubic structure) having three intersecting sets of grooves (see Figure 2), the groove pitch (i.e., the main groove pitch) of 0.007 inches, a bottom opening angle triangle the angles of 55. 5/55. 5/69 degrees so that the height of the cube corner element is 76.2 microns (3.5 mils). 使用通过将25重量％的双酚A环氧二丙烯酸酯（可以商品名“劭沈巧13720”从Cytek商购获得）、12重量％的丙烯酸二甲氨基乙酯（“DMAEA”)、38重量％的TMPTA (三羟甲基丙烷三丙烯酸酯）和25重量％的1，6-HDDA(二丙烯酸己二醇酯）进行组合而形成的树脂组合物来制备立体角微结构。  By using 25 wt% bisphenol A epoxy diacrylate (trade name "Shao Shen Qiao 13720" commercially available from Cytek supplier), 12% by weight dimethylaminoethyl acrylate ( "DMAEA") the resin composition of 38% by weight of TMPTA (trimethylol propane triacrylate), and 25 wt% of 1,6-HDDA (hexanediol diacrylate esters) formed by combining the prepared cube corner microstructures. 该配制物含有0. 5pph的TPO (2，4，6-三甲基苯甲酰二苯基氧化膦）光引发剂。 TPO (2,4,6- trimethylbenzoyl diphenylphosphine oxide), the formulation comprising 0. 5pph photoinitiator. 在室温下以15fpm的速度将树脂化合物浇注到加热至140 T的金属工具上。  The resin at a speed of 15fpm compound poured onto the heated metal tool 140 T at room temperature. 通过具有间隙的橡胶轧辊将树脂组合物填满工具中立体角微结构的空穴，所述的间隙被设定为使得树脂组合物填满工具上的压花图案的空穴，并使得位于工具的基体区域上的树脂的量最少。 By a rubber roll having a gap of the resin composition fills the hole tool cube corner microstructures, the gap is set so that the resin composition fills the hole pattern on the embossing tool, and positioned such that the tool minimum amount of resin in the base region. 使底漆/EAA膜/PET载体的底漆层与树脂的立体角微结构接触。 So that the primer / EAA film / cube corner microstructures primer layer and the PET carrier resin contact. 用一个功率被设定为360W/in 的Fusion D 紫外灯（Fusion D UV lamp)(可得自Fusion Systems, Rockville, MD)透过工具上的PET载体/EAA膜/底漆来固化立体角微结构树脂。 It is set to 360W / in power with a Fusion D UV lamp (Fusion D UV lamp) (available from Fusion Systems, Rockville, MD) on the tool through the PET carrier / EAA film / cube corner microstructures cured primer structure of the resin. 在紫外灯前面使用二向色性滤波器，以使对构造的红外加热最小化。 Dichroic filters were used in front of the UV lamp so that the configuration of the infrared heating is minimized. 在工具上固化立体角微结构之后，将复合物从工具上移除，用Fusion D紫外灯以600W/in的功率照射带有立体角元件的复合物的可聚合树脂一侧，以提供后紫外线辐照固化。 After curing cube corner microstructures on the tool, the composite is removed from the tool, with the Fusion D UV lamp at 600W / in power irradiated with composite cube corner element side polymerizable resin, to provide ultraviolet radiation curing. 使复合物通过被设置为150下的烘箱，以放松膜中的应力。 So that the composite is provided by an oven at 150, to relax the stress in the film. 以约2J/cm2 (0. 25kff, IOfpm)的能量对上文所述的每个第一构造（密封膜/PET载体）进行电晕处理。  about 2J / cm2 (0. 25kff, IOfpm) configuration of each of the first energy (sealing film / PET support) was subjected to corona treatment as described above. 将施加在构造的整个宽度上并与样品边缘齐平的2英寸宽3M™聚酯条带8403(3MTMPolyester Tape8403)(可得自3M公司）放置在第一构造的密封膜和第二构造的立体角微结构上，以形成带突出部。 The structure imposed on the overall width of the edges of the sample and flush with 1/2 inch wide 3M ™ Polyester Tape perspective 8403 (3MTMPolyester Tape8403) (available from 3M Company) was placed in the sealing film of the first configuration and the second configuration the corner microstructures to form tape tabs. 带突出部以后将用于启动90度剥离粘合力测试的剥离过程。 After starting with a projecting portion for stripping process 90 degree peel adhesion test. 使用由橡胶辊与加热的金属压花辊组成的12英寸宽层合机将第一构造与第二构造进行层合。  using a 12 inch wide laminator a metal embossing roll and a rubber roll composed of a first heating structure and a second structure for lamination. 压花辊上具有六边形密封图案。 A seal having a hexagonal pattern on the embossing roll. 层合压力为25磅/平方英寸，线速度为15 英尺/分钟。 Lamination pressure of 25 pounds / square inch and the line speed of 15 ft / min. 将第一构造与第二构造送入通过辊的辊隙，使得第一构造的密封膜上的带突出部与第二构造的立体角微结构上的带突出部对齐并且面对面，以消除带突出部区域的密封，并且可以为随后的测试启动剥离过程。 The first configuration and the second configuration is fed through the nip rolls, so that the projecting portion with the cube corner microstructures on the sealing film of the first configuration and the second configuration with the protruding portion and aligned face to remove protrusions with the sealing portion of the region, and may subsequently start the peeling test procedure. 将第一构造的PET载体面独立地靠着加热的压花辊（温度为300下和375 T )放置。 The PET carrier side independently of the first configuration against a heated embossing roll (a temperature of 300 and 375 T) is placed. 第二构造的PET载体面靠着橡胶辊，该橡胶辊由于与加热的压花辊相对接触而具有约115下的温度。 PET carrier surface against the rubber roller of the second configuration, since the rubber roller in contact with the opposite heated embossing roll having a temperature of about 115 at. 离开层合机的制品具有粘结在立体角微结构上的密封膜和2个允许启动剥离粘合力测试的带突出部。 Leaving the laminator article on an adhesive sealing film and the cube corner microstructures allowed to start two tape peel adhesion test projecting portion. 待制品冷却至室温后，将PET载体从密封膜上移除，并以约2J/cm2(0. 25kff, IOfpm) 的能量对密封膜进行电晕处理。  After the article to be cooled to room temperature, the PET carrier is removed from the sealing film, and of about 2J / cm2 (0. 25kff, IOfpm) energy of the sealing film is subjected to a corona treatment. 用未加热的层合机将防粘衬垫上的3密耳厚的丙烯酸树脂转移压敏粘合剂（与US6，677，030所述的类似）层合到密封膜上。 With a non-heated laminator 3 mil thick release liner on the pressure sensitive acrylic adhesive transfer (US6,677,030 and the like) laminated to a sealing film. 对于表1中的每个实例，从每个制品上切下两个1英寸宽、8英寸长的试验样品， 在每个试验样品的一端保留暴露的带突出部。  For each example of Table 1, were cut from each article two 1 inch wide, 8-inch long test sample retained in the exposed portion with a projecting end of each test sample. 移除转移粘合剂上的防粘衬垫，并将密封膜上暴露的粘合剂放置在未经处理的2. 75英寸X 11英寸铝板⑴Panel Lab Products, Cleveland, OH)上，并用2磅的橡胶辊以100英寸/分钟的速度前后辊压两次。 Remove the release liner on the transfer adhesive, sealing film and the exposed adhesive is placed on a 2.75 inches X 11 inch aluminum untreated ⑴Panel Lab Products, Cleveland, OH), and washed with 2 lbs the longitudinal rubber roller speed of 100 inches / minute rolled twice. 在进行粘合力测试之前，在室温下将铝板上的制品调理M小时。 Before adhesion test, conditioning the article at room temperature on an aluminum plate M hours. 移除施加在铝板上的制品的EAA膜上的PET载体，并将1英寸宽的Scotch®玻璃纤维条带898 (Scotch® Filament Tape898)(可得自3M公司）施加在带突出部和整个制品中的暴露的EAA膜的上方，以防止制品中的可延伸层被拉伸。  PET carrier EAA film is applied on an aluminum plate to remove the article, and a 1 inch wide strip of Scotch® glass fibers 898 (Scotch® Filament Tape898) (available from 3M Company) applied to the tape tab portion EAA film and exposed over the entire article to prevent extension layer article may be stretched. 将铝板安装在Instron拉伸试验机的滑动台上，从而确保在粘合力测试过程中保持90度剥离角度。 The aluminum plate mounted on the slide table of an Instron tensile tester, at 90 degrees to ensure that the peel angle during the adhesion test. 将带有玻璃纤维条带的带突出部放置于拉伸试验机的上方夹具中。 The tape tab portion with a glass fiber web is placed over the jig in the tensile tester. 根据ASTM D3330以12英寸/分钟的夹头速度进行剥离粘合力测试。 Peel adhesion test at a crosshead speed of 12 inches / minute in accordance with ASTM D3330. 表1中提供的剥离粘合力值是在300下和375下的压花辊温度下独立制备的两个样品的平均值。 Peel adhesion values ​​in Table 1 are the average of two to provide independently prepared samples at the embossing roll temperature at 300 and 375. 表1中的数据显示，当熔融指数值相当时，随着醋酸乙烯的含量增加，剥离粘合力也会提高（如实例2与3所示）。  The data in Table 1 show, when the melt index values ​​comparable with increasing vinyl acetate content, peel adhesion will increase (as described in Example 2 and 3). 数据还显示，当醋酸乙烯的含量值相当时，随着熔融指数降低，剥离粘合力也会降低（如实例3与4所示）。 The data also show that when the vinyl acetate content values ​​rather, decreases as the melt index, will be reduced peel adhesion (as described in Example 3 and FIG. 4). 按照针对实例1-5所述的方法制备实例6-10和比较例Cl，不同的是压花辊温度为315下，并且用表2中的树脂制备每个实例的密封膜。  6-10 and Comparative Examples Cl accordance prepared as described for Examples 1-5 Examples, except that the embossing roll temperature of 315, and Table 2 were prepared with a resin film of each sealing instance. 按照针对实例6-10所述的方法制备比较例Cl，不同的是用PrimaCOr3440作为密封膜树脂。  Comparative Example Cl was prepared according to the method for Examples 6-10, except that resin film as the sealing PrimaCOr3440. 当将第一构造和第二构造层合以形成制品时，PrimacOr3440密封膜不会附着到立体角微结构上。 When the first and second configurations to form a laminated article, PrimacOr3440 seal film is not adhered to the cube corner microstructures. 按照实例1-5中所述的方法制备样品并测量90度剥离粘合力。  Samples were prepared according to the method described in Example 1-5 and measuring the 90 degree peel adhesion. 剥离粘合力值被列于表2中。 Peel adhesion values ​​are given in Table 2 below. 表2中的实例6-10的树脂描述、熔融指数、熔融点以及维卡软化点的信息可从dupont. com网站上提供的产品数据表中获得。 Information table described resin, the melt index, a Vicat softening point and melting points of Examples 26-10 are available from dupont. Com site obtained in the product data sheet. 表2中的数据显示，实例6-10的密封膜很好地粘附在立体角微结构上，其中实例8和9具有最佳的附着性。  The data in Table 2 show that Examples 6-10 of the sealing film well adhered to the cube corner microstructures, wherein Examples 8 and 9 have the best adhesion. 比较例Cl的密封膜没有附着到立体角微结构上。 Comparative Example Cl seal film is not adhered to the cube corner microstructures. 按照针对实例1-5所述的方法制备实例11-15和比较例C2，不同的是压花辊温度为300 °F，并且密封膜是用80重量％的表3中的树脂和20重量％的4048白色VAC(4048ffhite VAC) (20重量％的EVA树脂与80重量％的TW2的混合物；可得自PolyOne Corporation, Avon Lake, OH)制备的。  according to the method for preparation of Examples 1-5 Examples 11-15 Comparative Example C2, except that an embossing roll temperature of 300 ° F, and the sealing film is made of 80 wt% and a resin in Table 3 20 wt% of white 4048 VAC (4048ffhite VAC) (20% by weight of an EVA resin with 80% by weight of the mixture of TW2; available from PolyOne Corporation, Avon Lake, OH) is prepared. 按照针对实例11-15所述的方法制备比较例C2，不同的是用Krystalgran PN03(聚氨酯，可得自Huntsman Polyurethanes, Houston, TX)作为密封膜树脂。  Examples 11-15 according to method for the preparation of Comparative Example C2, except that Krystalgran PN03 (polyurethane, available from Huntsman Polyurethanes, Houston, TX) as the sealing resin film. 按照实例1-5中所述的方法制备样品并测量90度剥离粘合力。 Samples were prepared in accordance with the method of Examples 1-5 and measuring the 90 degree peel adhesion. 剥离粘合力值被列于表3中。 Peel adhesion values ​​are shown in Table 3. 表3中的数据显示，实例11-15的密封膜很好地粘附在立体角微结构上，其中实例13和14具有最佳的附着性。 The data in Table 3  shows examples 11-15 good sealing film adhered to the cube corner microstructures, Examples 13 and 14 which have the best adhesion. 比较例C2的密封膜（聚氨酯）对立体角微结构的粘合力非常低。 Sealing film of Comparative Example C2 (urethane) is very low adhesion to the cube corner microstructures. 按照针对实例1-5所述的方法制备实例16，不同的是压花辊温度为300下。  prepared as described for Examples 1-5 of Example 16, except that the embossing roll temperature of 300. 按照针对实例1-5所述的方法制备样品并测量90度剥离粘合力。 90 ° Peel Adhesion according to for sample preparation and measurement method described in Example 1-5. 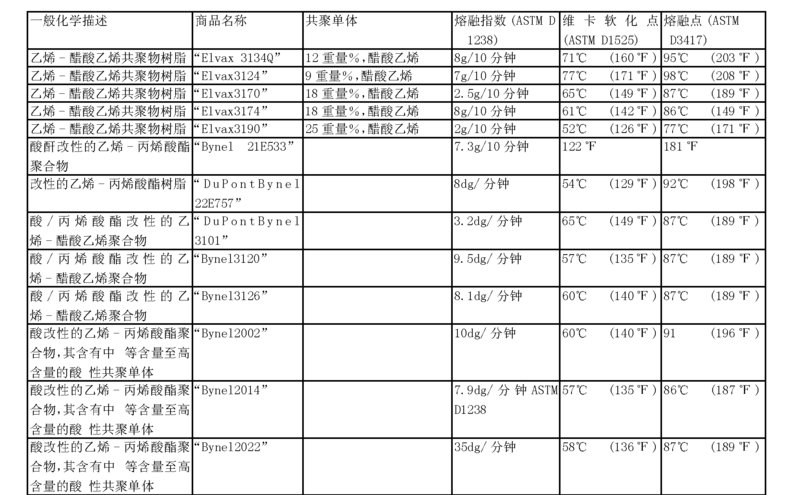 剥离粘合力值被列于表4中。 Peel adhesion values ​​are listed in Table 4. 表4中实例16的树脂描述、熔融指数与熔融点的信息可从dupont. com网站上提供的产品数据表中获得。 Examples of the resin table 416 is described, the product data sheet information and the melting point of the melt index available from dupont. Com website obtained. 表4中的剥离粘合力值显示，乙烯/醋酸乙烯/ 一氧化碳三元共聚物在用作密封膜时可以很好地粘附在立体角微结构上。  peel adhesion values ​​in Table 4 show, ethylene / vinyl acetate / carbon monoxide terpolymer, when used as the sealing film can be well adhered to the cube corner microstructures. 按照针对实例1-5所述的方法制备实例17和比较例C3，不同的是压花辊温度为300 °F。  according to the method of Example 1-5 for the preparation of Example 17 and Comparative Example C3, except that the embossing roll temperature of 300 ° F. 实例17是用10重量％&SURLYN1705-1 (可得自杜邦公司）和90重量％的BYNEL3U6制备的。 Example 17 is 10 wt% & SURLYN1705-1 (available from DuPont) and 90% by weight of BYNEL3U6 prepared. 按照实例1-5中所述的方法制备样品并测量90度剥离粘合力。 Samples were prepared in accordance with the method of Examples 1-5 and measuring the 90 degree peel adhesion. 其剥离粘合力值被列于表5中。 Peel adhesion values ​​are listed in Table 5. 表5中实例C3的树脂描述、熔融指数、熔融点以及维卡软化点的信息可从dupont. com网站上提供的产品数据表中获得。 Information Table in Example 5 described resin, the melt index, melting point and Vicat softening point C3 is available from dupont. Com site obtained in the product data sheet. 表5中的数据显示，密封膜可通过混合具有不同立体角粘合特性的材料来制备。 Data  Table 5 shows that the sealing film may be prepared with a different perspective angle characteristics of the adhesive material by mixing. 在表5中，比较例C3的SURLYN1705-1是较差的密封膜材料，但其与90重量％的BYNEL3U6 混合后，混合的组合物可以很好地粘附在立体角微结构上。 In Table 5, Comparative Example C3 is inferior in SURLYN1705-1 sealing film material, but after BYNEL3U6 mixing 90% by weight of mixed composition can be well adhered to the cube corner microstructures. 勒克斯/平方米。 Lux / square meter. 1. 一种柔性回射制品，其包括：弹性模量小于7 X IO8帕斯卡的透光性聚合物本体层； 从所述本体层的主表面凸出的多个立体角元件；以及单层或多层的密封膜，该密封膜粘附在所述本体层的至少多个部分上，使得所述密封膜与所述立体角元件保持空气界面；其中与所述本体层接触的所述密封膜为热塑性聚合物材料，该聚合物材料包含：量为至少50重量％的烯属烃的反应产物，以及至少一种非酸性的极性单体的反应产物，并且所述热塑性聚合物材料包含酸改性物、酸酐改性物、一氧化碳改性物、或它们的组合。 1. A flexible retroreflective article, comprising: an elastic modulus less than 7 X IO8 Pascals transparent polymeric body layer; a plurality of cube corner elements protruding from the main surface of the body layer; and a single layer or the multilayer sealing film, the sealing film is adhered to at least portions of the bulk layer, such that the sealing membrane to keep the air interface to the cube corner member; wherein the sealing membrane in contact with the body layer a thermoplastic polymer material, the polymeric material comprises: an amount of at least 50% by weight of the reaction product of an olefinic hydrocarbon, the reaction product and at least one non-acidic polar monomers and the thermoplastic polymeric material comprises an acid modified, anhydride-modified, carbon monoxide modification, or combinations thereof. 2.根据权利要求1所述的柔性回射制品，其中所述烯属烃含2至8个碳原子。 The flexible retroreflective article according to claim 1, wherein the olefinic hydrocarbon containing from 2 to 8 carbon atoms. 3.根据权利要求2所述的柔性回射制品，其中所述烯属烃为乙烯。 3. The flexible retroreflective article according to claim 2, wherein the alkylene is ethylene. 4.根据权利要求1所述的柔性回射制品，其中所述非酸性的单体选自醋酸乙烯、烷基(甲基）丙烯酸酯单体、以及它们的混合物。 The flexible retroreflective article according to claim 1, wherein the non-acidic monomer selected from ethylene, alkyl (meth) acrylate monomers, and mixtures thereof acetate. 5.根据权利要求1所述的柔性回射制品，其中所述密封膜还包含至少一种颜料、染料、 或它们的组合。 The flexible retroreflective article according to claim 1, wherein said sealing film further comprises at least one pigment, dye, or combinations thereof. 6.根据权利要求1所述的柔性回射制品，其中所述密封膜是多层膜，该多层膜具有设置在所述立体角元件与第二膜层之间的密封膜层。 The flexible retroreflective article according to claim 1, wherein said sealing film is a multilayer film, the multilayer film having a sealing layer between the element and the second film layer disposed on the solid angle. 7.根据权利要求6所述的柔性回射制品，其中所述第二膜层选自a)膜组合物，其包含如权利要求1所述的热塑性聚合物材料，并且还包含5重量％至20重量％的颜料，b)膜组合物，其包含如权利要求1所述的热塑性聚合物材料，并且具有与所述密封膜层不同的熔体流动指数，以及c)膜组合物，其包含与权利要求1所述的热塑性聚合物材料不同的热塑性聚合物材料，并且可任选地在所述密封膜层与第二膜层之间包括粘结层。 The flexible retroreflective article according to claim 6, wherein said second layer is selected from a) film composition, comprising a thermoplastic polymeric material as claimed in claim 1, and further comprising 5 wt% to 20% by weight of a pigment, b) film composition, comprising a thermoplastic polymeric material as claimed in claim 1, the sealing film layer and having different melt flow indices, and c) a film composition comprising and a different thermoplastic polymer material as claimed in claim 1, the thermoplastic polymer material, and optionally comprises an adhesive layer between the sealing film layer and the second layer. 8. 一种回射制品，其包括： 多个立体角元件；和单层或多层的密封膜层，该密封膜层粘附在所述立体角元件的多个部分上； 其中与所述立体角元件接触的所述密封膜层为热塑性聚合物材料，该热塑性聚合物材料包含：量为至少50重量％的烯属烃的反应产物，以及至少一种非酸性的极性单体的反应产物，并且所述热塑性聚合物材料包含酸改性物、酸酐改性物、一氧化碳改性物、或它们的组合。 A retroreflective article, comprising: a plurality of cube corner elements; and a monolayer or multilayer sealing film, the sealing film layer adhered to a plurality of portions of the cube corner element; and wherein said the sealing film layer is in contact with the cube corner elements of thermoplastic polymer material, the thermoplastic polymeric material comprising: a reaction product in an amount of at least 50% by weight of olefinic hydrocarbons, and at least one non-acidic polar monomer reaction the product and the thermoplastic polymer material comprises an acid-modified, anhydride-modified, carbon monoxide modification, or combinations thereof. 9. 一种微结构化制品，其包括： 多个微结构化元件；和单层或多层的密封膜，该密封膜粘附在所述微结构化元件的多个部分上； 其中与所述微结构化元件接触的所述密封膜为热塑性聚合物材料，该热塑性聚合物材料包含：量为至少50重量％的烯属烃的反应产物，以及至少一种非酸性的极性单体的反应产物，并且所述热塑性聚合物材料包含酸改性物、酸酐改性物、一氧化碳改性物、或它们的组合。 A microstructured article, comprising: a plurality of micro-structured elements; and a monolayer or multilayer sealing film, the sealing film is adhered to a plurality of portions of the microstructured member; and wherein the the sealing membrane contacts said microstructured member is a thermoplastic polymer material, the thermoplastic polymeric material comprising: a reaction product in an amount of at least 50% by weight of olefinic hydrocarbons, and at least one non-acidic polar monomers the reaction product, and the thermoplastic polymeric material comprises an acid-modified, anhydride-modified, carbon monoxide modification, or combinations thereof. MX341955B (en) * 2010-04-15 2016-09-08 3M Innovative Properties Co Retroreflective articles including optically active areas and optically inactive areas. MX341957B (en) 2010-04-15 2016-09-08 3M Innovative Properties Co Retroreflective articles including optically active areas and optically inactive areas. MX351877B (en) 2013-03-15 2017-11-01 3M Innovative Properties Co Microtiled prismatic cube corner articles.